Executive Mosaic is honored to introduce Carl D’Alessandro, president of the critical networks segment at Harris Corp., as an inductee into the 2016 edition of the Wash100 — Executive Mosaic’s annual selection of influential leaders in the government contracting arena. D’Alessandro was appointed to his current role in July as part of the company’s reorganization into four business segments after Harris’ $4.75 billion acquisition of Exelis that closed in the first half of 2015. 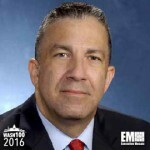 Harris’ critical networks segment is headquartered in Herndon, Va. and provides managed services to customers in areas such as engineering, ground network operations, air traffic management and maritime communications. Critical networks revenue represented approximately 29 percent of Harris’ overall sales for the second quarter of the company’s 2016 fiscal year, which runs on a July-June basis. D’Alessandro’s three-decade career at Harris includes executive roles such as vice president and general manager of the civil business unit, VP of advanced programs and technology and corporate VP of technology and government segment growth programs.